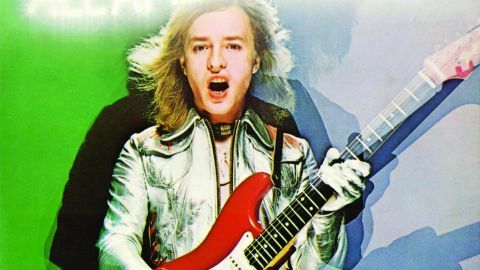 Rick Derringer was the Alex Chilton-style teen prodigy – he was 17 when he sang The McCoys’ 1965 US No.1 Hang On Sloopy – who managed to forge a successful 70s career. Looking like a hard rock David Cassidy, he could have been a pop star but he had other plans, like being a blistering guitar-slinger for hire on a lot of your favourite records by Steely Dan, Todd Rundgren, Alice Cooper and Johnny and Edgar Winter. He was more than just a flashy sidekick, though, as his solo debut All American Boy (1973) proved. An underappreciated gem, this time Derringer was the centre of attention with the illustrious guests (Joe Walsh, David Bromberg), and it’s a measure of his ability to straddle the cool/commercial divide that it featured both Suzi Quatro and a co-write with Patti Smith (the fab Hold). His strongest collection, it ranged from his biggest hit, the hardkicking boogie of Rock And Roll, Hoochie Coo, to lachrymose tongue-in-cheek ballad The Airport Giveth (The Airport Taketh Away). Spring Fever (1975) came with a cover of Rufus Thomas’s classic SOFTWAREmark” gingersoftwareuiphraseguid=“54a2adf2-58d5-4d5c-9767-f1d0e9fe9a0d” id=“fe3b6d9b-9d7a-4bbc-ae5b-b9cf58a6d00e”>SOFTWAREmark” gingersoftwareuiphraseguid=“c39af6d3-1112-4a47-ac06-ca5b8eb3f4f9” id=“7fd38979-b923-49e3-a81a-3857a9ad964e”>Walkin’ The Dog as well as Chick Corea on Moog and David Johansen on electric harmonica. Guitar And Women (1979) was given a power pop punch and sheen by co-producer Rundgren and featured two tracks written by Cheap Trick’s Rick Nielsen, then in his Dream Police pomp. Completing this four-CD set is Face To Face (1980), including a cover of Neil Young’s My My, Hey Hey (Out Of The Blue).